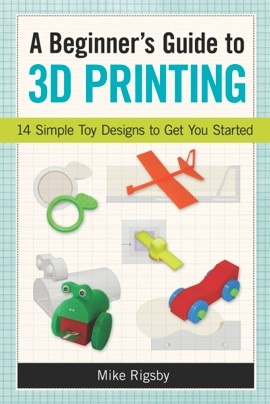 A Beginner’s Guide to 3D Printing is written for those who would like to experiment with 3D design and manufacturing, but have little or no technical experience with the standard software. Professional engineer Mike Rigsby leads readers step-by-step through fifteen simple toy projects, each illustrated with screen caps of Autodesk 123D Design, the most common free 3D software available. The projects are later described using Sketchup, another free popular software package. The book, published by Chicago Review Press, will be available October 1, 2014. Visit Froggy World, a 3D Printing Project! See our iPad Apps. For more books by Mike Rigsby, click here.